The Sun is a star and is the centre of our Solar System. It is not solid but is a big gas ball. The Sun is very hot. The temperature at the Sun’s core is 15,000,000?C. The Sun is 4.5 billion years old, about halfway through its life. 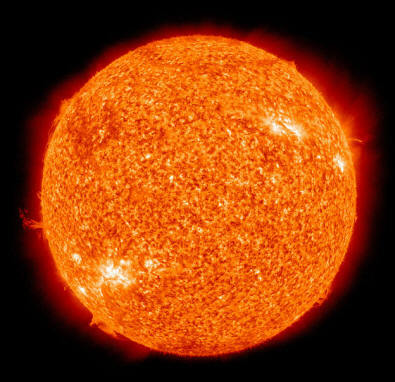 The Sun is very big and measures 1,391,980 kilometres (864,938 miles). The Sun provides light and heat to planets. Those nearest the Sun are very hot while those furthest away are very cold. Earth is the perfect distance away from the Sun and the Sun’s warmth and light supports life on the planet.